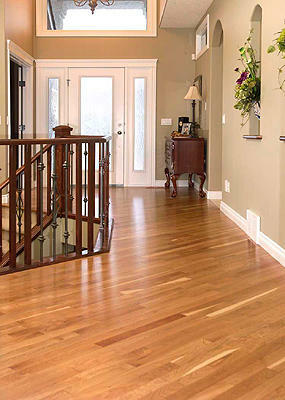 Engineered flooring is constructed by laminating a multi-laminate backer with a real wear layer of hardwood. Thickness of engineered flooring can range from 5/16" to 5/8" and widths can range between 2-1/4" to 6" wide. Wear layer thickness can vary and should be taken into account when purchasing. Engineered flooring will have a shorter average length due to the way it is manufactured. Usually engineered flooring is pre-finished with a four-sided bevel but there are some unfinished engineered products.